After a bouldery and technical start, the climbing dramatically eases as large knobs appear. Because the crux is the first move, this is an easy way to break into the 5.10a realm. 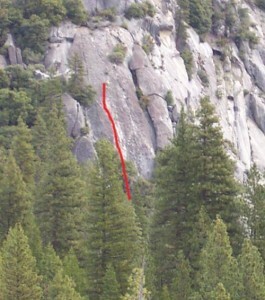 By Yosemite standards, this climb is well-protected at all the hard sections and runout once the climbing eases to 5.4. Which SuperTopo guidebooks include a topo for Just for Starters?